Dr. Caroline Styles trained at Cambridge University and The Royal London Hospital, then obtained Membership of the Royal College of Physicians, before specialising in Radiology. She completed a two year fellowship in cross sectional imaging in Perth, Australia before being appointed as a Consultant in Bath in 2001. 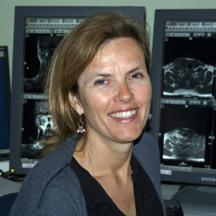 Caroline is a Cross-sectional Radiologist with special interests in both Chest and Head and Neck radiology. She is a member of the Royal College of Radiologists, Society of Head and Neck Radiologists and the British Thoracic Society. She is involved in departmental teaching of both medical students and doctors, including radiology trainees, and is an examiner both for medical school finals and on a final FRCR teaching course.